Toronto Chinatowns (Chinese: 多倫多華埠) are ethnic neighbourhoods in and around Toronto, Ontario, Canada, with a high concentration of ethnic Chinese residents and businesses. There are multiple Chinatowns in Toronto and the Greater Toronto Area. When used directly, the name typically refers to West Chinatown, which extends along Dundas Street West and Spadina Avenue. The Chinese community in this Downtown Chinatown originated from First Chinatown, which was located what used to be known as The Ward in the early 20th century. With changes in the city and subsequent waves of immigration from the mid-20th century onwards, Toronto has since developed East Chinatown at the intersection of Broadview Avenue and Gerrard Street, as well as Chinatowns in Scarborough and North York. In the Greater Toronto Area, Markham, Mississauga, and Richmond hill, have all developed sizable Chinatowns. These neighbourhoods are major cultural, social and economic hubs for the Chinese-Canadian communities of the region. The Ward, c. 1910. Toronto's first Chinatown was situated in The Ward, an area that attracted new immigrants to the city. Toronto's Chinatown first appeared during the 1890s with the migration of American Chinese from California due to racial conflict and from the Eastern United States due to the economic depression at the time. The earliest record of Toronto's Chinese community is traced to Sam Ching, who owned a hand laundry business on Adelaide Street in 1878. Ching was the first Chinese person listed in the city's directory and is now honoured with a lane named after him. The first Chinese cafe opened in 1901 and that number grew to 19 in 1912 and to around 100 a decade after that. First Chinatown (1870s–1961): The original Chinatown was centred near present-day Elizabeth Street and Hagerman Street near Chestnut Residence (43°39′14″N 79°23′06″W﻿ / ﻿43.654°N 79.385°W﻿ / 43.654; -79.385). West Chinatown (1950s–Present): The present downtown Chinatown is centred at Spadina Avenue and Dundas streets (43°39′11″N 79°23′53″W﻿ / ﻿43.653°N 79.398°W﻿ / 43.653; -79.398). The first Chinatown went along Elizabeth and York Street, between Dundas and Queen Street. The First Chinatown of Toronto existed in the 1890s along York Street and Elizabeth Street between Queen and Dundas Streets within Toronto's Ward district. Situated in what was then known as "The Ward", one of the city's largest slum areas for incoming immigrants, the area was expropriated and razed in 1955, despite myriad protests, to make way for Toronto New City Hall and Nathan Phillips Square, with only one-third of this original Chinatown left south of Dundas Street. More than three-quarters of the neighbourhood was commandeered as a result of the forced dispossession. The remaining portions of the neighbourhood were saved by Chinese business and community leaders in the 1970s including Jean Lumb, who established the "Save Chinatown Committee". Nevertheless, due to the city's disruption, much of the cultural and economic centre of the downtown Chinatown have since shifted west to Spadina Avenue and Dundas Street. Up to the 2010s, many Chinese restaurants continue to be in the area of Dundas Street West from Elizabeth Street to Centre Street. Although the iconic Sai Woo Restaurant on near Dundas Street West and Bay Street has since closed, Wah Too Seafood Restaurant, Yueh Tung Restaurant and Hong Shing continue to thrive in the area. The present day West or "old" Chinatown is located along Spadina Avenue, emerging with the influx of Chinese immigrants in the 1960s. The present day Chinatown along Spadina, known also as West Chinatown, Old Chinatown, or Downtown Chinatown was formerly a Jewish district. Although a small Chinese community was already present in this location prior to the 1950s, this Chinatown was formed mainly when businesses with the financial ability moved from the First Chinatown to the Spadina location. With the influx of Chinese immigration during the 1960s due to the lifting of Canada's racial exclusion policies, along with much of the Jewish population moving north along Bathurst Street, Chinese businesses expanded in this area. Following the demolition of first Chinatown to make way for Toronto City Hall, the Chinese community migrated westward to the neighbourhood around Spadina Avenue and Dundas Street West. A handful of Chinese businesses still remain around Bay and Dundas and Elizabeth and Dundas. Today, the economic and social centre of Toronto's downtown Chinatown primarily runs north-south along Spadina Avenue to College Street to Sullivan Street and east-west along Dundas Street West from Augusta Avenue to Beverley Street. A mansion that is converted to the Italian Consulate is at the northwest corner of Dundas and Beverley. The Chinese population greatly increased as the wives and descendants of the Chinese men already in Canada immigrated to the city after the country's Chinese exclusion act was lifted in 1967. In the following decades, students and skilled workers arrived from Hong Kong, Guangdong province and Chinese communities in Southeast Asia and the Caribbean further increased the Chinese population, which led to the creation of additional Chinese communities east of Toronto. The neighbourhood has been noted as being a "near complete community" with housing, employment, and commerce, along with schools and social services all located within walking distance in the neighbourhood. Since the 2000s the West Chinatown has been changing from the influx of new residents, businesses from immigrants and 2nd generation Canadians. The neighbourhood has continued to serve as a vital market hub and services. to both people from inside the neighbourhood and outside. The central location of the neighbourhood has also been a draw for property developers, changing the face of the neighbourhood. The El Mocambo live music venue is in the northern end of Chinatown, although this establishment was there before the neighbourhood became Chinatown. Both the 505 Dundus and 510 Spadina streetcar routes run through Chinatown. The area hosts diverse set of East Asian cuisines, groceries, and shops. Toronto's Chinatown is one of the largest in North America. It is centred on the intersection of Dundas Street West and Spadina Avenue, and extends outward from this point along both streets. With the population changes of recent decades, it has come to reflect a diverse set of East Asian cultures through its shops and restaurants, including Chinese, Vietnamese, and Thai. The major Chinese malls in the area are Dragon City and Chinatown Centre. Since the 1990s, Chinatown has been struggling to redefine itself in the face of an aging Chinese population and the declining number of tourists visiting the enclave. As the aging population shrank, revenues of businesses in the neighbourhood also decreased. While the majority of the grocery stores and shops remain, most of the once-famed restaurants on Dundas Street West, especially the barbecue shops located below grade, have closed since 2000. Competition from commercial developments in suburban Chinese communities also drew wealth and professional immigrants away from downtown. Unlike those newer developments in the suburbs, Chinatown's economy relies heavily on tourism and Chinese seniors. As many younger, higher-income immigrants settled elsewhere in the city, those left in the district are typically from older generations who depend on downtown's dense concentration of services and accessibility to public transportation. In the early 21st century, downtown neighbourhoods became more attractive to urban professionals and young people who work in the Financial District, as well as its proximity to the University of Toronto and to OCAD University, leading to the gentrification of surrounding areas and potentially changing the face of West Chinatown. A lion dance in Chinatown, 1975. Historically, Chinatown residents were immigrants from southern China and Hong Kong. Historically, Toronto's Chinatown has been represented by immigrants and families from southern China and Hong Kong. Since the transfer of Hong Kong's sovereignty to the People's Republic of China in 1997, immigrants from mainland China have greatly exceeded those from Hong Kong. However, at present Cantonese remains the primary language used by businesses and restaurants in Chinatown. The Chinese immigrant population now consists of distinct subgroups. To the east of Spadina Avenue, numerous university students attending the University of Toronto, OCAD University (formerly the Ontario College of Art and Design), and Ryerson University live in many of the small houses built as workers' housing. The diversity brings a more multicultural flavour to the district, but it may gradually reduce or eliminate its identity as Chinatown. Examples of street name signs in Old Chinatown. The bilingual signs (in Chinese and English) were first introduced in the 1970s. A number of streets in Chinatown are bilingual, a feature first introduced in the 1970s. The translations are mainly phonetic and use Chinese characters defined through Cantonese or Taishanese pronunciations. Changes to the first downtown Chinatown neighbourhood as well as Chinese immigration encouraged the development of new Chinese enclaves within the Greater Toronto Area. Chinatown East another smaller Chinese community in Riverdale. Formed in 1971, Chinatown East is centred around Gerrard Street. With the expropriation of the first downtown Chinatown as well as subsequent property values increased in the Spadina avenue Chinatown, many Chinese Canadians migrated to Toronto's east end in Riverdale. A second, somewhat smaller, Chinese community was formed, beginning in 1971 with the opening of Charlie's Meat. Centred on Gerrard Street East between Broadview Avenue and Carlaw Avenue at 43°40′00″N 79°20′50″W﻿ / ﻿43.666614°N 79.347295°W﻿ / 43.666614; -79.347295, Chinese-Vietnamese and mainland Chinese immigrants dominate this district. Known as East Chinatown, it covers a smaller area than Toronto's main Chinatown west of downtown, but is growing. As with many Canadian Chinatowns, the demographics of East Chinatown has been changing with gentrification and immigration. First Markham Place, a Chinese mall in Markham, Ontario. The Chinese community in Markham emerged in the 1990s, and is the largest concentration of Chinese people in Greater Toronto. Markham's experience as a suburban Chinatown is similar to that of neighbouring Richmond Hill and emerged in the 1990s, though the developments are less intensively developed and more spread out through the municipality. Markham itself has the largest proportion of Chinese among all the GTA municipalities. 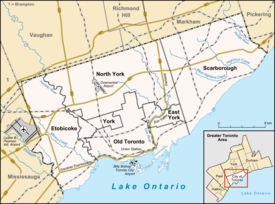 In the 1980s and early 1990s, then-Mayor Tony Roman was leading trade delegations to Asia in which he promoted Markham as a great place to live and invest. On Highway 7, between Woodbine and Warden Avenues, is First Markham Place, containing numerous shops and restaurants; formerly anchored by Home Outfitters, this is several kilometers east of Richmond Hill's Chinese malls. Further east along Highway 7 is an older plaza is at the southwest quadrant with the intersection with Kennedy Road. The most well-known Chinese mall in Markham is the Pacific Mall, at Kennedy Road and Steeles Avenue East, which, combined with neighbouring Market Village Mall (closed 2018 to be re-developed as Remington Centre) and Splendid China Mall, forms the largest Chinese shopping complex in North America, with over 700 stores between the three malls. In close proximity, at Steeles East and Warden Avenue, there is the New Century Plaza mall and a half-block away there is a plaza of Chinese shops anchored by a T & T Supermarket. While influx new immigrants brought many jobs and much wealth to the areas they settle, their presence and "Chineseness" became a target of racial intolerance from some. In 1995, Deputy Mayor of Markham Carole Bell argued that the concentration of ethnic groups were a cause of social conflict, saying "the weakness of it comes when there is a concentration, when you are getting only one group of people". She went on to say "everything's going Chinese" in Markham, stating that they were driving away the "back bone of Markham away...the people who run festivals, coach our kids, organize our business communities, Brownies, Guides, Scouts." In response, the twelve mayors of the Greater Toronto Area signed a letter dissociating themselves from Bell's comment. The gate to Pacific Mall's Heritage Town. Pacific Mall is a widely known Chinese mall within Greater Toronto. Mississauga's growing Chinese population is spread out across the vast suburb, but the commercial community has been traditionally centred on the Chinese Centre, located at 888 Dundas Street East, just east of Cawthra Road. This large complex, built in the late 1980s, was constructed to reflect China's cultural heritage; an elaborate gate greets visitors on Dundas Street, with a Nine Dragon mural just inside, while red towers with pagoda-styled roofs abound. Growth of this Chinatown is limited, but Mississauga's Chinatown remains an active community. The second newer stretch includes markets and restaurants in strip mall plazas close to the intersection of Burnhamthorpe Rd. West at Central Parkway (near the Erindale GO Station) which remains in the growth phase catering mostly to the needs of the growing Chinese population in the city who live nearby. A Chinese supermarket in North York. Small plazas featuring Chinese businesses began to proliferate into North York in the 1980s. The former city is home to large pockets of Chinese immigrants, but there are only a few malls serving it and mostly located in the east end. The smaller plazas containing restaurants and supermarkets have proliferated in the 1980s at the Finch Avenue/Leslie Street intersection, Keele Street and Sheppard Avenue, and around Victoria Park Avenue and McNicoll Avenues. These often compete with and complement the Agincourt Chinatown. The Finch-Leslie plaza is still thriving, because of the relative wealth of North York, though its patronage has now diversified. However, the gradual departure of the northern Scarborough Chinese clientele has led to the decline of businesses around Victoria Park and McNicoll. Time Square, a Chinese plaza in Richmond Hill. During the 1990s, wealthy Chinese immigrants moved directly to suburban Richmond Hill. During the 1990s, wealthy Chinese immigrants, primarily from Hong Kong, moved directly to suburban Richmond Hill, where they set up businesses and shops catering to that community. Many shops and restaurants were established in suburban-style shopping malls and plazas (such as Times Square) along a stretch of Highway 7 between Bayview Avenue and Leslie Street. The most intense development is concentrated around the Commerce Valley Drive/Beaver Creek Road loop. Some of the well-known higher end Chinese banquet restaurants are in this area. Consequently, some colloquially use the term "Highway 7" to refer to the newly established Chinatown there. There are similarly thriving Chinese plazas in Markham several kilometers east on Highway 7, and many families often visit both communities on the same day. The Scarborough neighbourhood of Agincourt saw an influx of Chinese people from Hong Kong and Taiwan during the 1980s. Two neighbourhoods in Scarborough, Agincourt and Milliken, saw an influx of Hong Kong Chinese and Taiwanese during the 1980s, especially around Sheppard Avenue and Midland Avenue. Since the development of Agincourt's Dragon Centre Mall in the 1980s, it has become a booming "Chinatown" and was the vanguard for the proliferation of "Chinese malls", large malls with restaurants and stores catering specifically to the Chinese community, across the GTA. Since 2000, the Agincourt Chinese population is spread thinly and many are leaving for communities north of Toronto. Pockets of Chinese areas are likely to remain, but they will be less vibrant when compared with the late 1980s and early 1990s. Bo Ling's Chop Suey Palace in Metro-Goldwyn-Mayer's 1983 film A Christmas Story where the Parker family eat peking duck on Christmas Day was filmed here (744 Gerrard Street East). The 1999 Chow Yun-fat film The Corruptor was set in the New York City Chinatown, with scenes filmed in the Chinatowns of New York and Toronto. The television series Kung Fu: The Legend Continues was filmed in Chinatown at Spadina Avenue and Dundas Street West for many episodes of its 1993–97 run. Filmed in Toronto, it portrays the Chinatown of an unidentified major U.S. city. On an episode of the 1990s series Due South entitled "Chinatown" (Season 1, episode 6), Toronto's Dundas and Spadina Chinatown stood in for Chicago's Chinatown. Toronto's Chinatown is featured prominently in the 2008 collection of short stories The Chinese Knot and Other Stories by Lien Chao. Toronto band Do Make Say Think have a song titled "Chinatown" on their 2002 album & Yet & Yet. The film Suite Suite Chinatown, directed by Aram Siu Wai Collier, was screened at the 14th Toronto Reel Asian International Film Festival. The Pixar animated short, Bao, was set in Toronto, and included scenes from Toronto's Chinatown. ^ "Toronto's First Chinatown". "The first Chinese resident recorded in Toronto was Sam Ching, the owner of a hand laundry business on Adelaide Street in 1878." ^ "Toronto Tourism: Chinatown". "Sam Ching was the first Chinese person to be listed in the city directory"
^ City Surveyor. "Naming of Public Lanes Bounded by Yonge Street, Queen Street East, Parliament Street and the Railway Corridor" (PDF). Staff Reports. City of Toronto. Retrieved 22 March 2014. ^ Scheinberg, Ellen; Yee, Paul (7 June 2015). "Life in the Ward". Toronto Star. Retrieved 7 June 2015. ^ a b "Spadina Avenue & Chinatown West". www.lostrivers.ca. Retrieved 2019-04-01. ^ a b c d Chan, Arlene (2011). The Chinese in Toronto from 1878: From Outside to Inside the Circle. Dundurn Press. ISBN 9781554889792. ^ a b Thompson, Richard H. (1989). Toronto's Chinatown : the changing social organization of an ethnic community. New York: AMS Press. ISBN 0404194397. ^ a b Silva, Michelle da (2017-01-25). "Toronto's changing Chinatown: who is it for?". NOW Magazine. Retrieved 2019-03-11. ^ a b "Chinatowns grapple with new development, changing demographics". Retrieved 2019-03-11. ^ "11 people rescued as East Chinatown blaze destroys building". CTV Toronto. 13 July 2013. ^ "The Carole Bell Incident". Chinese Canadian National Council Toronto Chapter. Archived from the original on 2015-04-03. ^ Persaud, Nadia. "Chinatown comes to life on Scarborough big screen." Toronto Observer. November 22, 2010. Retrieved on August 22, 2013. ^ McLaughlin, Amara (15 June 2018). "Pixar's 'Bao' serves up the Toronto experience — CN Tower, Chinatown, streetcars". CBC News. Canadian Broadcasting Corporation. Wikivoyage has a travel guide for Kensington & Chinatown. Wikimedia Commons has media related to Chinatown, Toronto.